A beautiful garden is the crown jewel of any home. It gives you and the neighbors something pretty to look at, and dramatically increases curb appeal. They may be lovely, but they're hard work to maintain. Trees lose leaves and branches, hedges wither, and flowers wilt, leaving you with an unsightly mess. Let the Ohuhu Garden Waste Bags come to the rescue! 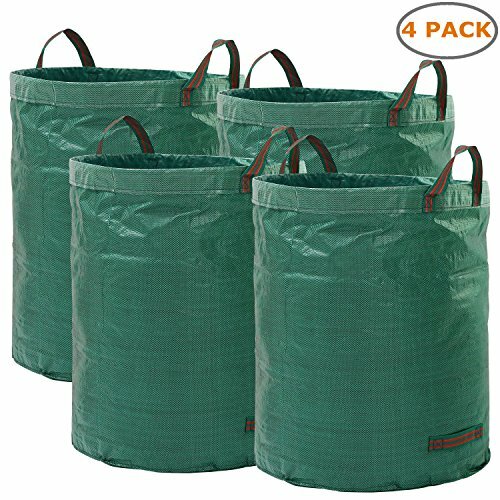 These giant, durable bags make garden waste disposal easily. Thanks to the 72 gallon capacity, you can get rid of all of your yard waste at once. The fabric is tear-resistant, water-repellent, and UV stabilized, and the flexible hoop holds the bag open for you. These bags are also a great storage solution- use them to hold, toys, clothes, and much more. They can handle any job you might have for them. Please do not put the waste bag under the sun for a long time exposure as it may shorten the service life.